Hello everyone, welcome to another time on gourmetguide234.com! Owing to the importance of farming in the entire world, the need to know more about Vertical Sack Farming becomes very imperative. One of our team members, a sound Agricultural Engineer, Adeyemi Jeremiah is here to look at VERTICAL SACK FARMING! Vertical Sack Farming is the use of sack, buckets for planting crops that have shallow roots. More often as not, they are not bushy, they do not grow tall and most times, they do not take long to mature! Such crops include lettuce, onion, tomato, cucumber, watermelon, okra, pepper, spinach, onions, capsicums, cowpeas, beans, sweet potato vines and squash butternuts, ginger and others etc. However, sacks farming is low-cost and economical but high-yielding food security method developed to maximize land and water use. The vertical sacks farming does not require much from anyone who wants to venture into it. The sacks or the bags come in small, medium and large sizes. The large size vertical bags have holes in them where stem seedlings are planted. The interesting thing about sack farming is that it can be placed anywhere ranging from offices, backyard, schools, hospitals and small-scale farms. In sack farming, there are two major design, the one with the horizontal layer of stone and the one with stones or gravel in the middle of the sack. 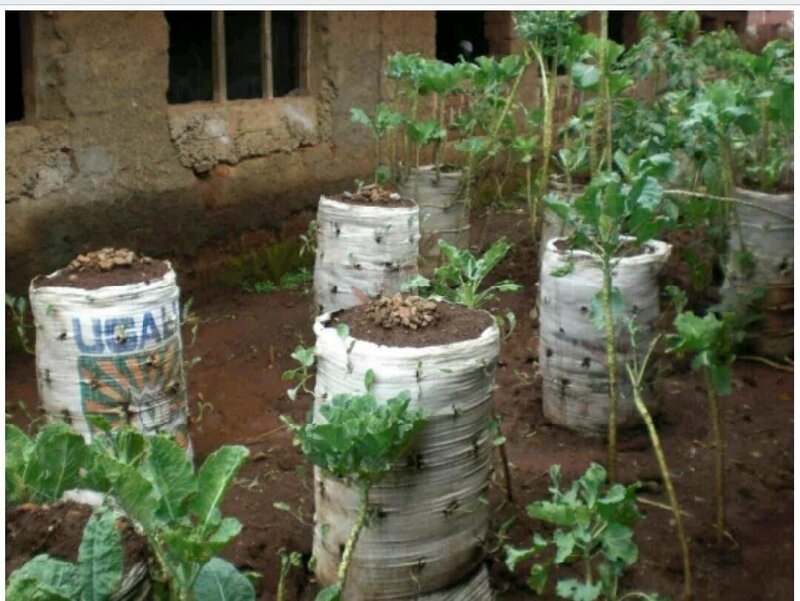 If you intend to plant all around the sack then the best design is the one with stones in the middle because it allows for even distribution of water, nutrient and air. But if you don’t intend to plan around the sack then the design without stone is better. …We got this video from the internet! Pierce through the centre of the sack bottom into the soil using a sharp and strong rod. This rod will provide support to the sack farming. Then, fold the edges of the sack to allow easy filling with the mixed soil. Add one foot of the soil/manure mixture into the sack and water this soil layer so that it is evenly moist. Place a can without a top at the centre of the sack such that the supporting rod is inside the can. You can use a 2Kg can or a can of about 5 cm diameter. Then, fill the can with stones/gravel. Lift the can so that it stands on the newly laid layer and water this level so that the soil is evenly moist. Repeat the procedure of filling the can with gravel and the area around it with soil/manure mixture until the whole sack is filled. Add supporting rods at the side of the sack if need be. Use a sharp stick to pierce the sack for planting holes. Use your thumb to press the soil downwards to make the planting hole bigger. Ensure that the planting holes are not in the same line vertically so that the plants don’t block each other from accessing sunlight. Place the seedling into the planting hole carefully not to damage the roots. Press the soil around the seedling using your fingers to make it firm. 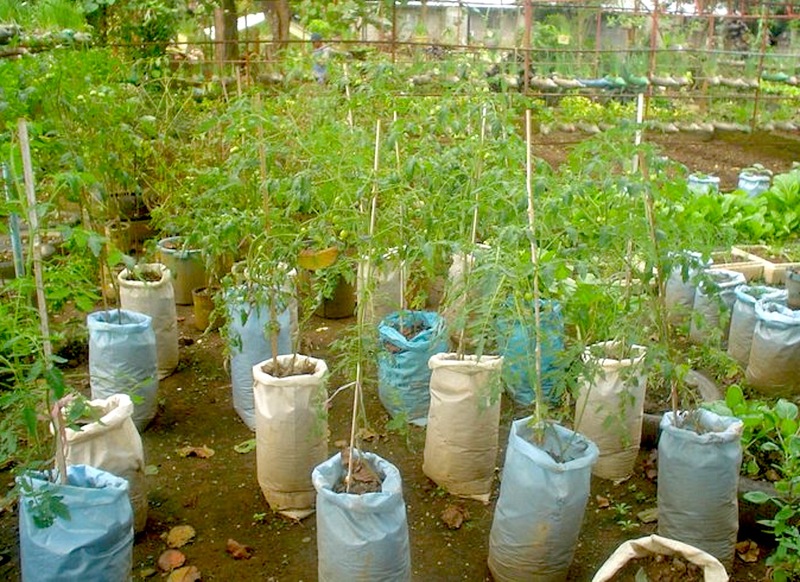 Water each sack garden every day to keep the soil moist. Note: A sack is N50, you can use polythene bags its cheaper even broken buckets. Previous Post World Sickle Cell Day!